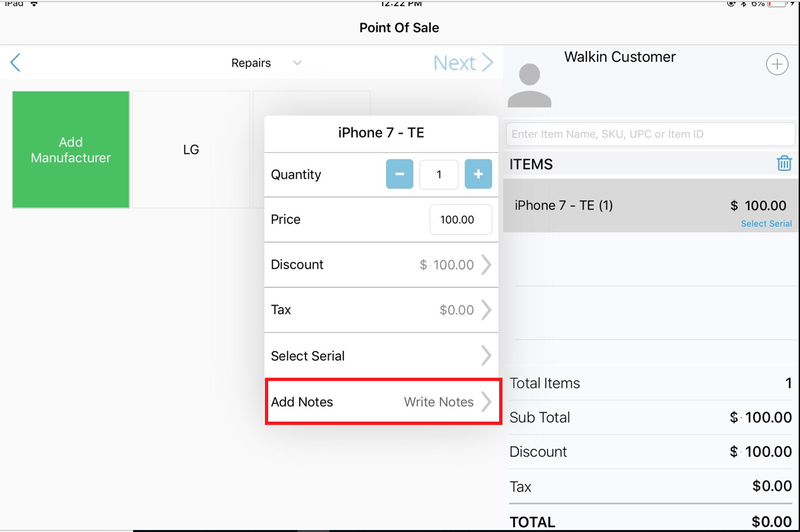 This guide is designed to help cashiers in your cellphone store learn daily processes around selling using RepairDesk POS Register. 1. Select and add desired item to shopping cart. 3. 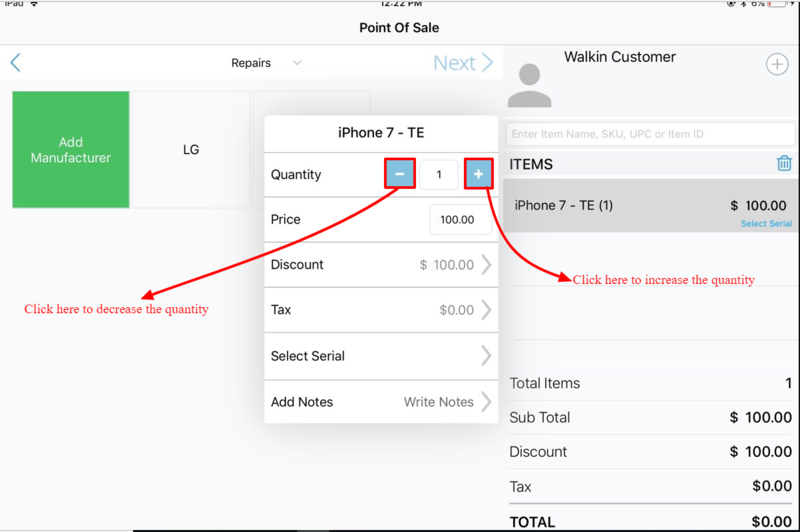 You can either change quantity manually or use "+" sign to increase or "-" sign to decrease quantity. Note: Please note that quantity can only be changed for "Inventory Items". 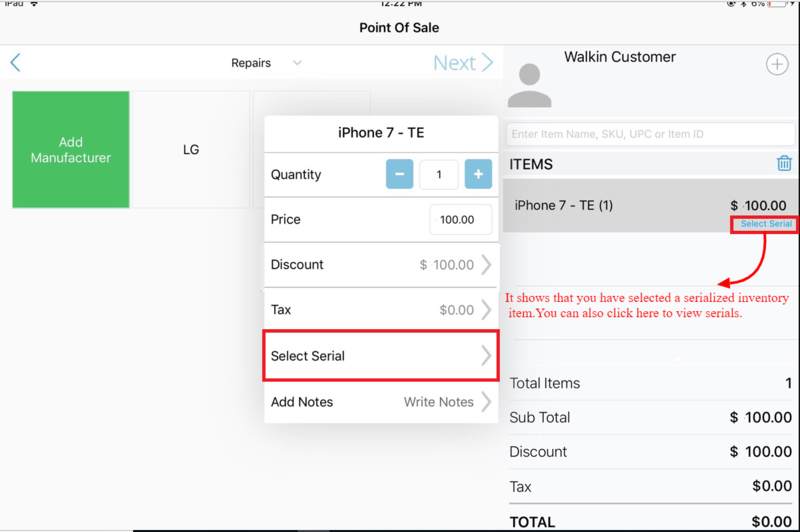 You cannot change the quantity for "Service Items" and "Serialized Items". From the list please select a serial and click Save. 4. Cart will be updated and you can click on Checkout to complete the transaction. 1. Select or scan item barcode to add it to shopping cart. 2. Tap on "item name" and following popup will appear. 3. Simply edit the price under price field as "shown above" and click on checkout to complete the transaction. 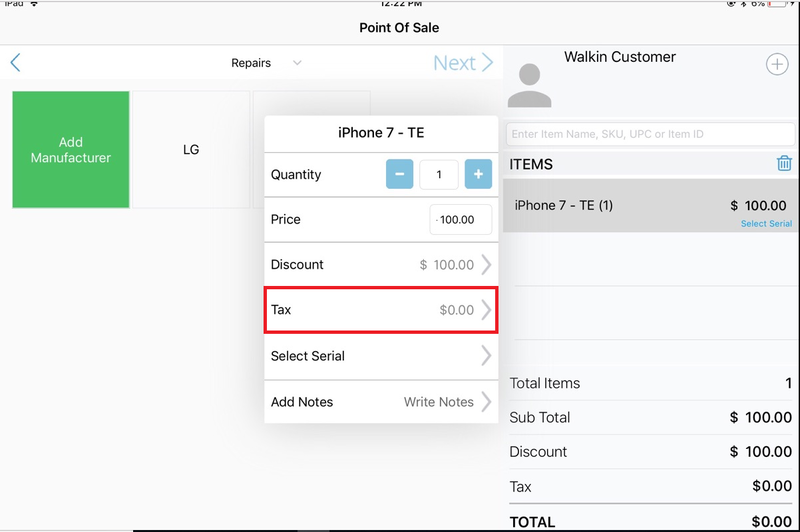 Line item discounts are useful when you want to discount certain products of the sale without affecting others. The method below demonstrates how to perform a line item discount. 2. Tap on the "item name" to get the details popup. 3. 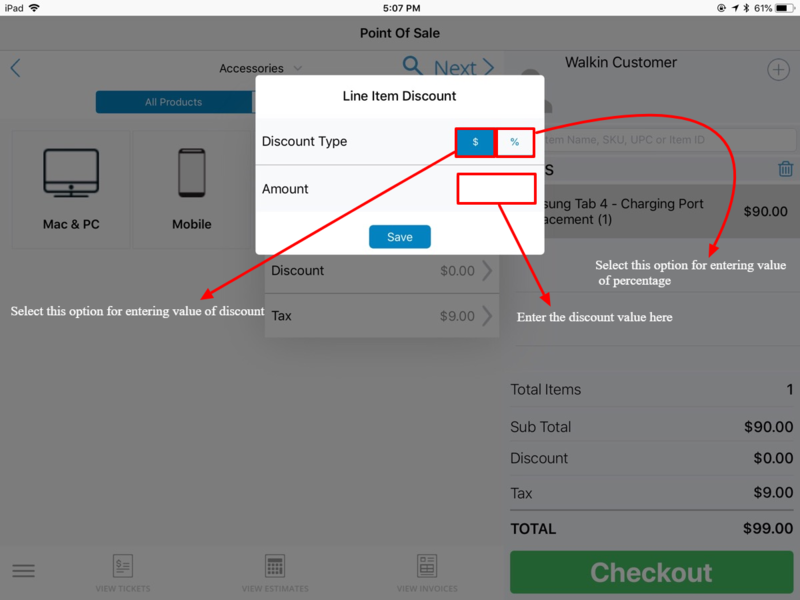 To apply a line-item discount, now tap on "Discount" field. 4. From the next screen you can either apply a fixed amount (e.g. 2 dollars off) or percentage (e.g. 15% off) discount and click on checkout to complete the transaction. Tip: It's always good to check that the discount has been applied correctly, so that your customer isn't over or under charged. From the below screen you can select new tax class e.g. Tax Exempt in case a customer is paying in cash and click on checkout to complete the transaction. Tip: It's always good to check that Tax has been applied correctly, so that your customer isn't over or under charged. 3. Tap on Add Notes option. 4. A screen will display where you can add specific notes. Tip: Add Notes option can only be used for Inventory Items, Casual items and Trade-In and will not be displayed for Service Items.